Stack-On Hutch Adds Overhead Storage For 60" Wide Desks And Credenzas In The Lorell Commercial Steel Desk Series With Commercial-Quality Performance And Components. Use The Two Wire-Management Grommets And Included Hardware To Mount It Onto A Desk Or Credenza Of The Same Size. Stack-On Hutch Is A Great Solution For Small And Large Work Spaces That Need To Store Materials Above The Worksurface But Still Within Reach. Built-In Cord Management Provides Easy Access To Power And Data While Minimizing Clutter. Steel Construction Withstands Heavy Activity And Relocation. Flipper Doors Are Sold Separately. Hutch Is Not Intended To Be Used Freestanding..
Stack-On Hutch Adds Overhead Storage For 60" Wide Desks And Credenzas In The Lorell Commercial Steel Desk Series With Commercial-Quality Performance And Components. 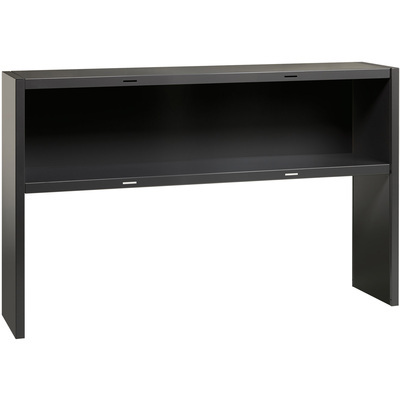 Use The Two Wire-Management Grommets And Included Hardware To Mount It Onto A Desk Or Credenza Of The Same Size. Stack-On Hutch Is A Great Solution For Small And Large Work Spaces That Need To Store Materials Above The Worksurface But Still Within Reach. Built-In Cord Management Provides Easy Access To Power And Data While Minimizing Clutter. Steel Construction Withstands Heavy Activity And Relocation. Flipper Doors Are Sold Separately. Hutch Is Not Intended To Be Used Freestanding.